The mission of Gwyneth’s Gift Foundation includes utilizing our fundraising capabilities and partnerships to assist qualified schools, businesses, and community organizations in acquiring AED. 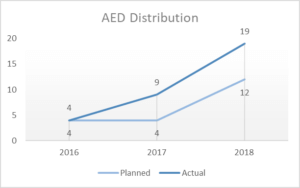 The foundation began awarding AEDs in 2016 and have increased the number of devices deployed year over year. Gwyneth’s Gift has established a relationship with the AED Superstore that will allow us to not only purchase the device itself, but a set of pads, wall mounted case, signage and a year subscription to assist with the management of the device. The average cost of an AED is $1,500. It is the intent of the Foundation to distribute, at a minimum, one AED to a qualified recipient per quarter for a total of at least four per year. In three years, the Foundation has exceeded that goal and we are projecting 19 AED distributions in 2018. AED requests are submitted via the Foundations application process. As additional applications are submitted, and funds remain available, we will consider issuing additional funds to cover the costs for those localities/schools/programs within Virginia. Our aim is to provide this program across our Region and over time across the Commonwealth. Must include distance to nearest hospital. The AED must be placed where it would be visible and easily accessible for emergency response. Award recipients must notify local emergency medical services (EMS) when AED is installed at qualifying location. Recipient is responsible for the routine maintenance of the AED. Recipient is responsible for the training of staff in CPR and the use of an AED.